The bird itself doesn’t contribute much umami, but not to worry, there’s a good chance that most you will make up for that with a basting liquid of some kind (often broth) and gravy to serve alongside it at the table. Typically, gravy is made from broth, little bits of giblets, some pan drippings, seasonings and some thickener—all cooked down into thick, liquid deliciousness. Consider enhancing the taste of your gravy by using a dash of soy sauce or tamari, a pinch of monosodium glutamate (MSG), or mushrooms, which is what’s demonstrated here (interesting Umami Gravy from the blog Nom Nom Paleo). Or, for those of you who are gravy-challenged, gravy straight from a jar also does the trick (and it often has extra umami ingredients added to it).Either way you roll, your guests will be happy that the gravy is flowing because it injects a bit more umami goodness into the meal (not to mention makes up for a slightly dry bird—not that that would ever happen to you). Peas and potatoes provide more umami than you might think, and don’t they turn up on many a holiday table? You know it. 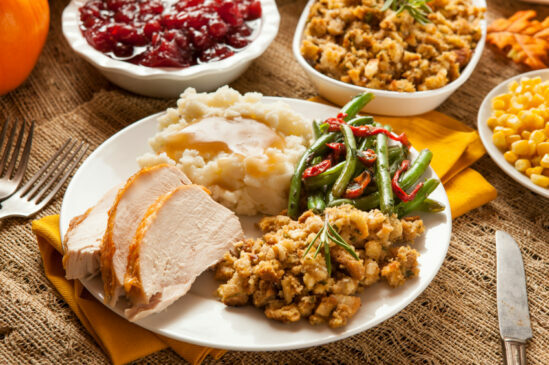 Other veggies are high in glutamate as well, but they probably aren’t as common on the Thanksgiving table. And don’t forget that sprinkle of cheese tossed over the salad or worked into the mashed potatoes! Parmesan and Roquefort are especially umami-rich. On their own, cubes of semi-dried bread are not what we’d consider a high-umami ingredient, but add some broth, maybe some mushrooms, some walnuts or even oysters if oyster dressing is popular at your table, and you’ve got something that provides lots of umami appeal. (Incidentally, there is actually such a thing as an Umami Oyster—look for them on the East coast.) Even cornbread stuffing would work, since corn does provide some umami. Lots of us use premade, purchased broth, and it’s sometimes enhanced with monosodium glutamate or other ingredients that provide umami to give it a more well-rounded, flavorful taste. Bouillon cubes do the same. You could also make your own umami-licious broth of course. If you find yourself wanting to know more about umami in food, dig into renowned chef Heston Blumenthal’s book (with a big lineup of awesome chef contributors from around the world), Umami: The Fifth Taste. For additional umami-rich recipe ideas and inspiration, check out our Savory Cuisine Corner on MSGdish. Kitty is a food and nutrition communications professional whose 25 years of experience is strongly focused on written communications, both from a food-centric perspective as well as a scientific one. Kitty’s scope of work includes recipe development, product development consultation and serving as a member of scientific advisory groups. She has authored several cookbooks. She is very active with Maine’s groups of nutrition professionals, and just completed serving a second term as the President of the Maine Academy of Nutrition and Dietetics. Previous PostIs There Evidence to Back Up Claims Against MSG? Next PostHow Do You Describe the Umami Taste?